Along with news about Android L and Android Wear, Google also announced a new vehicle focused initiative called Android Auto at this year's Google IO. Android Auto is Google's take on an in-car mobile experience and much like Apple's CarPlay it hopes to provide a seamless and unified experience across many different vehicles from many different manufacturers. Google Auto starts by extending the interfaces that Android users are familiar with. It uses the same card based design and colorful backgrounds as Google Now, and it functions in a similar fashion with cards that display information about travel routes, music playback, and other relevant information. Android Auto works by connecting to the user's smartphone or tablet and translating all the content on that into a simpler and more navigable interface for a vehicle. The Android Auto system is also designed to be functional with only the use of voice controls which will hopefully reduce the number of car accidents that occur because a driver is using their cell phone without paying attention to their driving. Android Auto has three main points of focus that Google feels are essential to providing the best in-car experience for the user. The first is a fairly obvious necessity for an in-car operating system, navigation support. 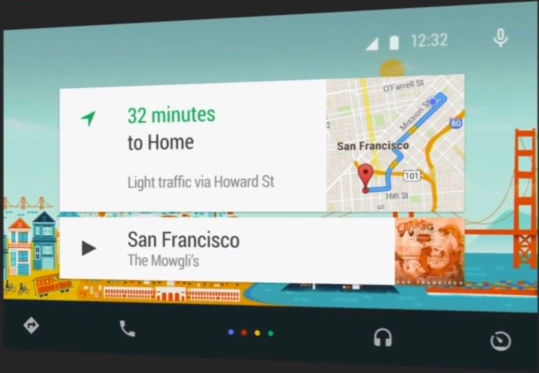 By using Google Maps and Google's navigation features the Android Auto system acts as a hands-free GPS. The user can simply tell Google Now what destination they would like to navigate to and it will bring up a card with traffic info and an estimated travel time. The user can then confirm they wish to begin navigation and the map interface will open with driving directions spoken over the car's speaker system and a visual map displayed on the screen. 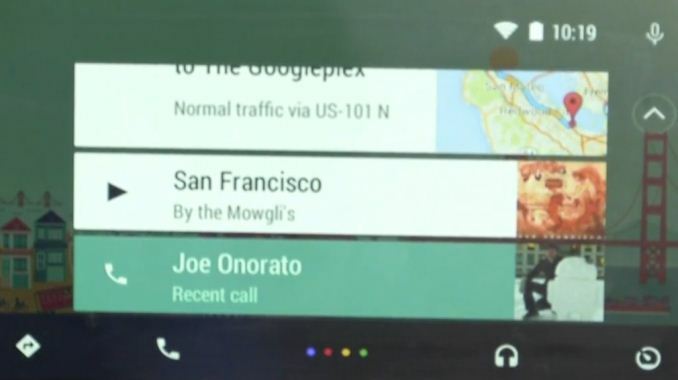 Communication is the second main focus of Android Auto. People are becoming increasingly connected and are constantly bombarded with phone calls, text messages, etc. Android Auto wants to make managing this constant communication safer for users by letting the user keep their hands on the wheel and eyes on the road rather than fiddling with their smartphone. Because Android Auto works by running off of the user's phone it can display notifications for texts, calls, and other messages right on the vehicle's built-in display alongside all the other cards for navigation and music. The user can use Google Now to dictate a message using their voice and then send it without ever having to pick up their phone. They can also make phone calls and speak aloud without having to use one of their hands to hold their phone up to their ear. These features are great because they serve a dual purpose of simply being more convenient for the user, but also letting people drive safely while still being able to use their mobile device. The third point of focus is on music playback and streaming. Many people listen to music over the speakers in their vehicle and Google wants to make it easy for people to get to the songs they want to hear and to have access to all their music stored on their device as well as across multiple streaming platforms. As you can see above, Android Auto features a very simple interface for music playback with big buttons that are easy to press. 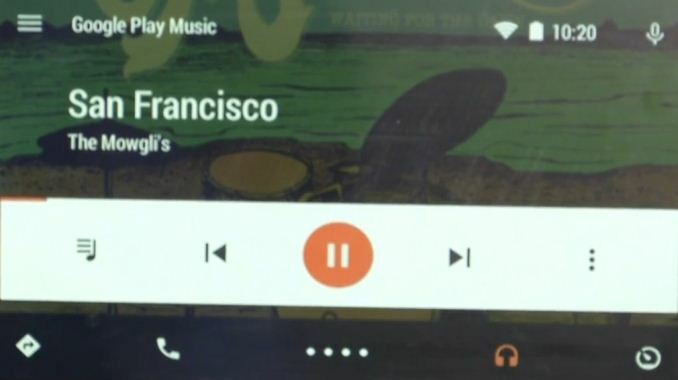 Like all the other features in Android Auto, the user can also control their music playback via voice control which makes navigating to a specific song as simple as asking Google Now to play that track. Google has also been working with major music streaming companies to get apps ready for Android Auto upon launch. Users will have access to all their music on streaming services like Pandora and Spotify in addition to all the music they have stored locally on their smartphone or tablet. To ensure Android Auto is an ever evolving and improving experience for users, Google is making an Android Auto SDK available for developers so they can modify their apps to be functional and well integrated on in-car displays running this new extension of Android. Google has stated that the Android Auto experience will be available to users alongside the public Android L release later this year and that over 25 automobile manufacturers have signed up to ship cars with Android Auto support in the near future. More information on the list of manufacturers that plan to include Android Auto in their vehicles can be found on the Open Automotive Alliance website which is the home for all companies committed to using Android in automobiles. "The Android Auto system is also designed to be functional with only the use of voice controls"
The car manufacturer puts the physical buttons in the car. And usually they do, in fact. My car has them. What exactly is your complaint? That data connection is dependent upon what you're doing. It's the same with button or voice. Telling your phone to pull up your music app is the same as tapping on it. There's no internet connection involved. Now telling your app to look up the current traffic status then the internet connection requirement is the same with voice command, touch screen button and a physical button. For voice recognition you have to be connected to Google's servers. To click a button you don't.